Lots of action near the top of the Russian military pyramid today . . .
General-Lieutenant Andrey Shvaychenko’s exceptionally brief tenure as RVSN Commander came to an abrupt and unexpected end. He just turned 57 on June 18, and only commanded Russia’s land-based strategic forces for a little over 10 months. His predecessor—Nikolay Solovtsov—served for 8 years. Already past retirement age for his two-star rank, President Medvedev and Defense Minister Serdyukov apparently decided to replace rather than promote him. The timing of Shvaychenko’s replacement is interesting and most likely not accidental, to say the least. The Russians have swapped out a key figure just as they enter the process of ratifying a new strategic arms treaty with the United States. General-Lieutenant Sergey Viktorovich Karakayev replaces Shvaychenko. Like his predecessor, he’s a two-star general, but 8 years younger. He served as Chief of Staff, First Deputy Commander of the RVSN just since last October. He occupied RVSN command positions up to and including missile division commander and Vladimir Missile Army commander in 2006-2008. Somewhat atypically, he served some time as a department chief in the Defense Ministry’s Main Personnel Directorate. He completed studies in the civilian North-Western State Service Academy before finishing the General Staff Academy. He holds a doctorate in military science. His full biography is here. Pervyy kanal covered also covered the Gorki meeting, if you’d like some video. The change in the RVSN may be a result of the bumps and bruises of reaching internal agreement to go forward with the new strategic offensive arms treaty. Or maybe not. But something’s clearly wrong; a ten-month tenure is clearly far off the norm. Medvedev’s short comments aren’t much to go on, but they seem to say (a) Shvaychenko wasn’t doing the job the way his masters wanted; (b) the masters want an improved strategic nuclear command and control system; (c) the new arms treaty doesn’t threaten Russia’s nuclear deterrence capability and, therefore, is a good deal for Moscow; and (d) the RVSN Commander needs to focus his attention on the optimal operation of whatever weapons systems provided him by the country’s leadership. And Karakayev indicated in front of the cameras that he’s on-board with all this. 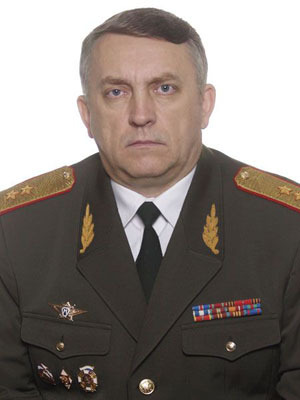 Armaments Chief Vladimir Popovkin also replaced First Deputy Defense Minister, General-Colonel Aleksandr Kolmakov. Popovkin seems to have accommodated Serdyukov, and fit well into the Defense Minister’s ‘new profile.’ The ex-Space Troops general seems to be the type of official the civilian leadership wants in its more civilian Defense Ministry. He will keep charge of the weapons portfolio, and training and readiness accounts overseen by Kolmakov will probably go back to the Genshtab. But more on this one tomorrow. This entry was posted in Command and Control, Force Modernization, Military Leadership, Serdyukov's Reforms, Strategic Deterrence, Strategic Forces Modernization and tagged Aleksandr Kolmakov, Andrey Shvaychenko, Nikolay Solovtsov, RVSN, Sergey Karakayev, Vladimir Popovkin. Bookmark the permalink.